We all remember that classic tv show The Three Stooges, well now you can relive the classic cinema comical antics of Larry, Moe and Curly whenever you like with this fantastic slot from Realtime Gaming. You can now play them as online slots at www.BarbadosBingo.com. Founded in 1998 in Atlanta Georgia, Real Time Gaming use one of the quickest casino software’s in the industry to provide users with unique and creative titles that span a range of platforms. They have a huge library of slots on offer, plus for those looking for more traditional games they also have a number of classic titles like Poker, Deuces Wild and Jacks or Better to try out. Play today with Real Time Gaming's Three Stooges and other games. Reminisce the past where Three Stooges brought us laughter with their unique comedy style. 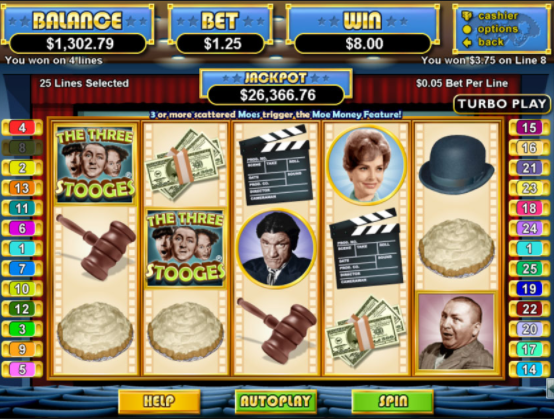 Even if you’re not familiar with the legendary Three Stooges you will still get a lot of enjoyment out of this slot game. It’s just oozing with nostalgia to for classic cinema and comedy of that era. The reels are filled with various items from back then like old school film spools, check boards, pies and large piles of dollars. Plus, as a nice nod to the roots of the Stooges there’s also a gigantic cinema screen in the background that you would expect an episode of The Three Stooges to suddenly appear on. Aside from its fantastic choice of style there’s also a surprisingly large amount of bonus features to take advantage of in this slot game. • THREE STOOGES WILDS: The Three Stooges logo is WILD in this slot and will substitute for other items in your combinations other than the Stooge SCATTERS. As an added bonus it will also triple your return on winning combos. • THREE STOOGES SCATTER BONUS: Land at least three of one set of Stooge SCATTER symbols on the reels and you will trigger one of three unique bonuses based on the character you unlock it with. • MOE MONEY BONUS: Land three or more Moe’s and this will unlock a mini-game where you have to select Moe symbols to earn prizes. On your first choice you will earn up to 25 free spins, on your second you will unlock a multiplier prize of up to 10x on your winnings. • CURLY CASH BONUS: Hit three Curly’s and you will earn up to 30 free spins, plus as an extra reward all your prizes will be tripled. • LARRY’S LOOT BONUS: Three Larry’s appearing in your combo will present you with a prize pick round where you have to choose a symbol and under each one is a multiplier prize of up to 1000x. 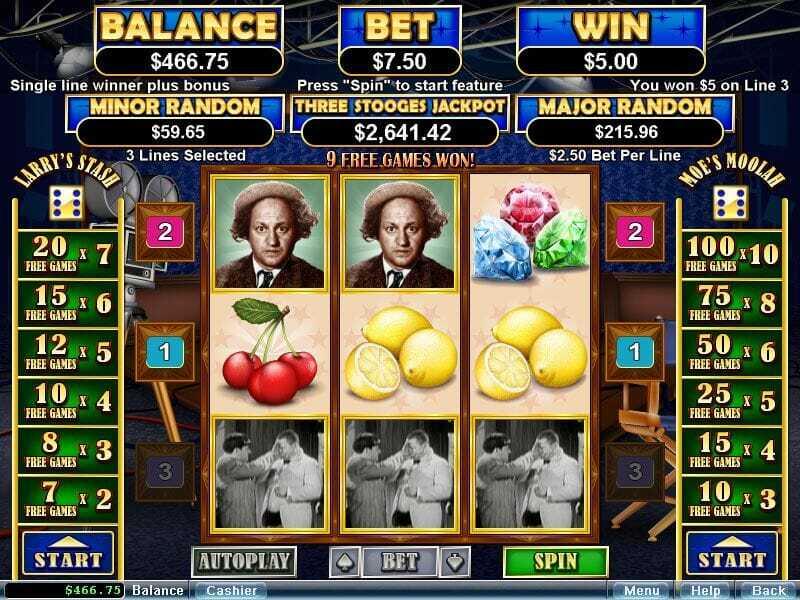 Brimming with nostalgia and bonuses this online UK slot game is a fantastic send-off to the legendary Three Stooges. There’s so many interesting ways to win big that you don’t want to miss out on this hilarious and fabulous slot game from the team at Real Time Gaming. If you enjoyed Three Stooges, play one more Barbados game now.